Of every shape and color! 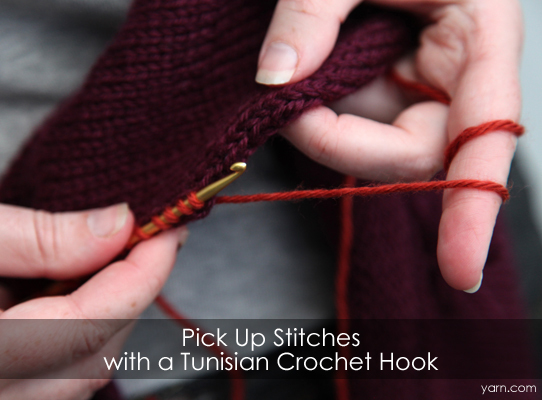 Whether you use a traditional hook, or prefer tunisian, we have a hook to fit your style. 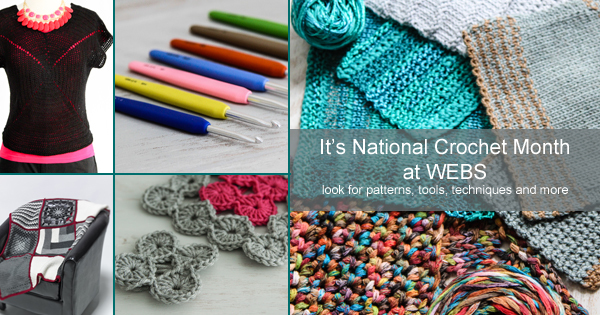 From the classic Susan Bates Silvalume and Quicksilver hooks, to steel hooks for fine thread work and large plastic hooks for for super bulky and rug working projects you’re sure to find the crochet tools you’ll need on our site or in our retail store. Skacel offers some great hook options in their addi line. The color coded hooks are available individually and in a full set. Their ergonomically shaped Swing hooks can help ease hand strain and they even have a set of click hooks for your tunisian work. Knitter’s Pride offers an almost unbelievable assortment of hooks. In the Dreamz line you have individual classic hooks and tunisian hooks as well as full classic sets and tunisian sets and you can purchase additional cables for your tunisian hooks. the also offer a specialty Symfonie Rose set with decorative Swarovski Crystals. Their newest Waves hooks feature color coded comfort grips and are also available individually and as a set. There’s also the line of Bamboo hooks, individual or in sets and as well as individual tunisian hooks and tunisian hook sets. Do you have a go-to hook brand? Do you change it up based on the project or fiber your using? Tell us all about your favorite hooks! Yesterday, we went through all our knitting needles and crochet hooks to purge the duplicates and unwanted ones. Now, what do you do with it all? For the organizationally challenged like myself, it can be so tedious sorting through that big pile, but it does pay off in the long run. When I’m ready to start a project, the last thing I want to do is dig through a bottomless pit of hooks, straights, circulars and double points, needle gauge in hand checking each one for the size I need. 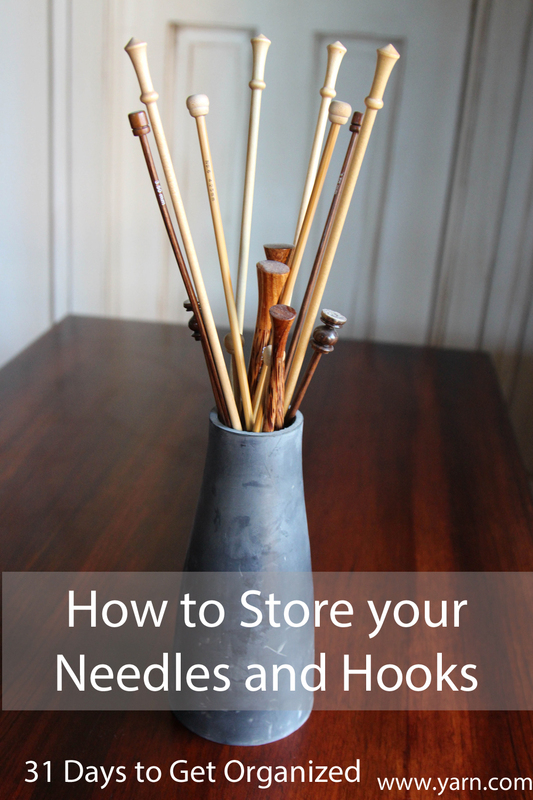 We asked our staff and our readers for some ideas on how to store your needles and hooks. Try using a needle roll. If you’re even a basic sewer, you can try making one yourself. It’s a fairly easy afternoon sewing project. 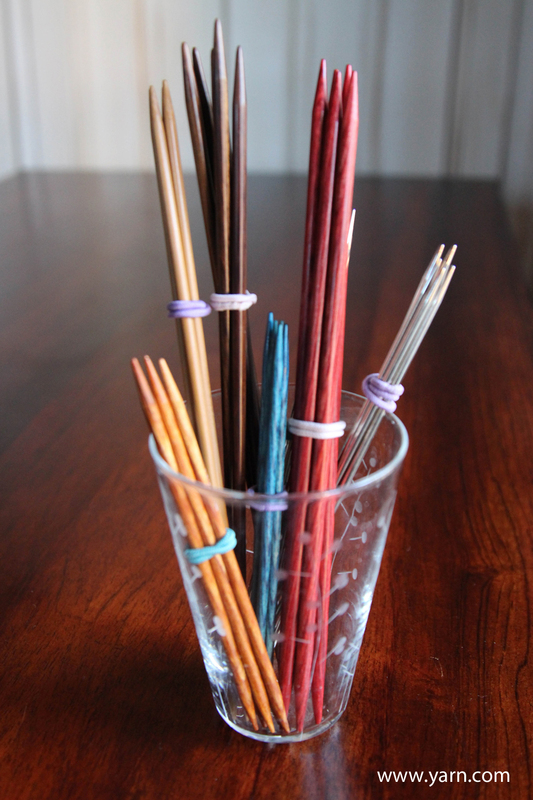 The most popular suggestion for storing your straight needles is to stand them up in a vase or a jar. You can let them fall where they may for a decorative look, or to keep things organized, use a rubber band or hair tie to secure same sizes together. You can keep your double points on display in a vase too. It’s best to tie these together by size so you don’t have to check each one when it’s time to start a project. You can use a rubber band, hair ties, or even twist ties. Keeping a three ring binder with page protectors for your double points and circulars is my favorite solution. I keep one size per page protector. 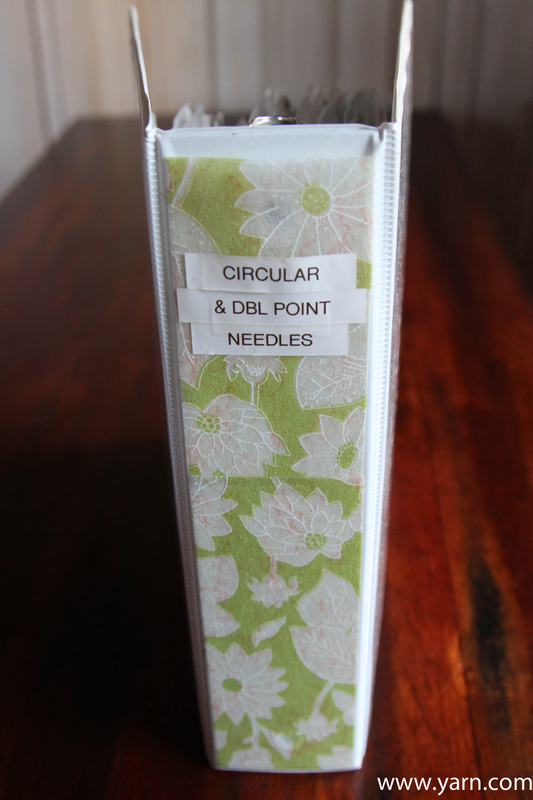 Double point needle tubes are an inexpensive solution for keeping them safe from breakage and organized by size. Tea tins are the perfect depth to stand your hooks up and keep them on display. If you have a big crochet hook collection, sorting by brand first and then size might be the way to go. A pencil case is a simple, compact and portable storage solution. The Lily Crochet Roll works great! Most interchangeable sets come with a carrying case already. You can usually fit some notions in the case too. The Della Q Fabric Case is a beautiful solution if you want something extra special to store your set. You can use your three ring binder for circulars too. I like to organize by cable length, then size. I have binder dividers sectioning off each cable length, so all the 24″ length needles are in one section, and then each size is in its own page protector. 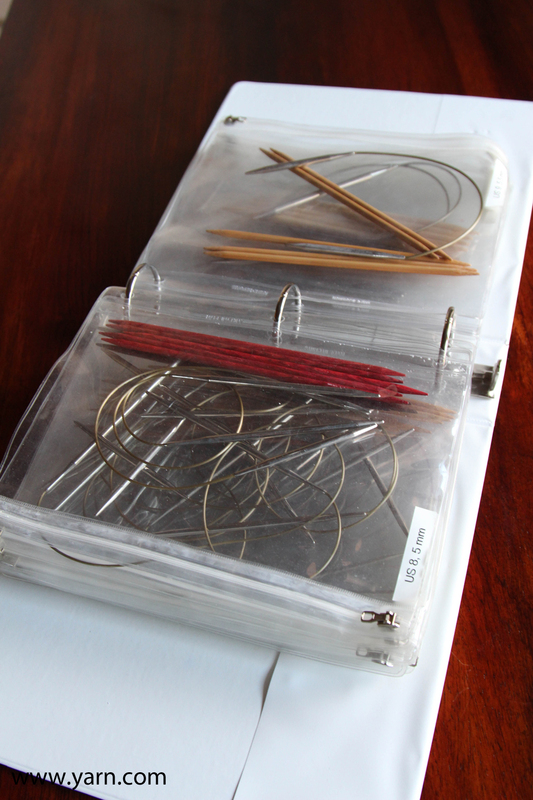 The Que Theo needle case keeps all your circulars organized and easy to find. I love the hanging circular needle organizer. It keeps needles on display and in order. You can keep your circular needles in separate boxes, and each size has its own zip-top baggie with the needle size written on it. The Namaste Circular case is an easy solution. Or, try getting a tri-fold portfolio style case from your office supply store. They are perfect for circulars. 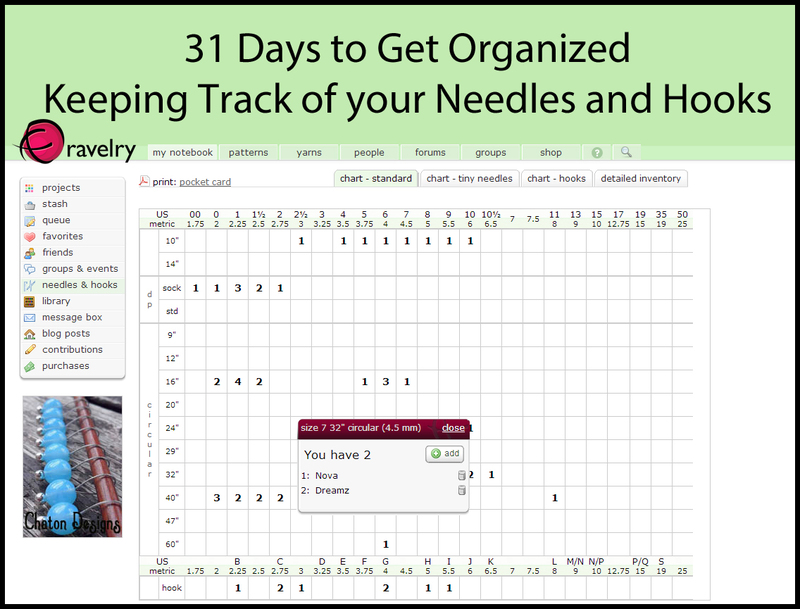 Write the needle size and cable length on the tabs to make them easy to find. The original packaging is actually an easy and economical way to store your circulars long term. They’re usually easy to open and close without ruining, and can even be hung up or filed away easily. 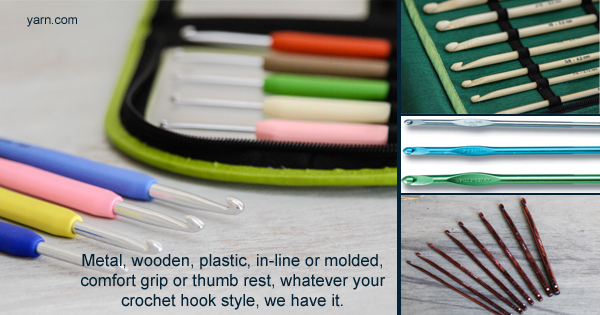 How do you like to store your knitting needles and crochet hooks? Do you like to keep them on display or tucked away in a binder or drawer? I love using interchangeable knitting needles. Late at night or after the yarn shop has closed, I know that I will still have just the right needle size for those spur-of-the-moment knitting projects that I just need to start…right now. 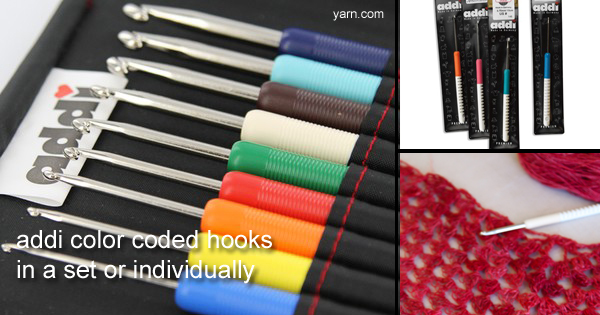 Now, many knitting needle companies (Denise, Knitter’s Pride, Addi) have added Tunisian crochet hooks that work with your interchangeable knitting needle sets. I’ve read about how if you have trouble picking up stitches you can pick them up with a crochet hook and transfer them to your knitting needle. But I find that method a little tedious. A much slicker method is to use an interchangeable Tunisian crochet hook to pick up stitches around a neck or along a button band. 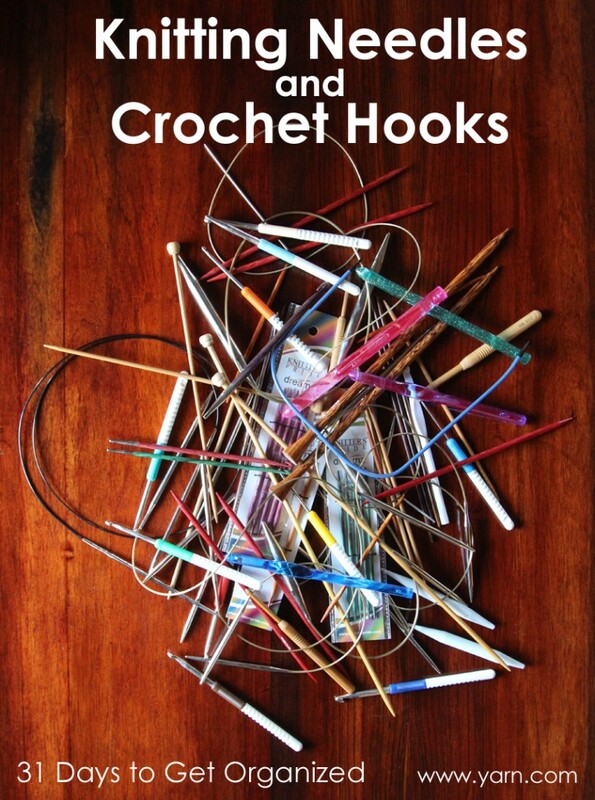 As you pick up the stitches with your hook, they slide along and collect on the cord. Once you’ve finished picking up the correct number of stitches, just switch out the Tunisian crochet tip for a knitting needle tip and away you go, knitting the button band or neckband. I’ve been noticing a lot of chatter lately on Ravelry about people adding the new Knitter’s Pride Symfonie Rose Sets to their wish lists. And I can see why. Both the Interchangeable Circular Knitting Needle Set and the Crochet Hook Set are beautiful with Symfonie Rose wood needles or hooks in a nice pretty case. 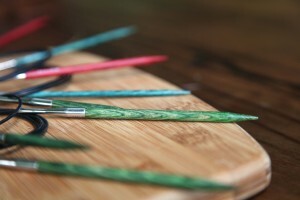 The circular knitting needle set comes with enough sizes and cord lengths to accommodate many of your knitting projects. 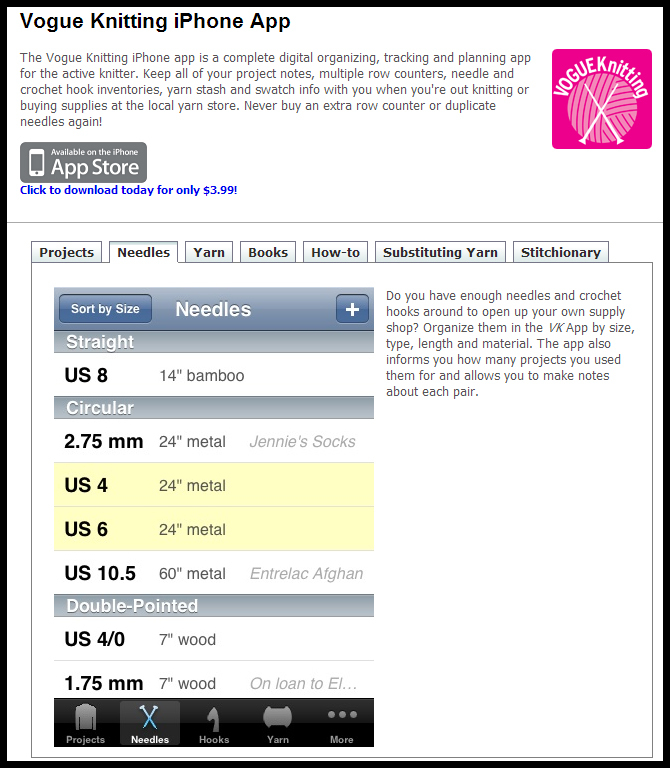 Needle tip sizes include US 4, 6, 7, 8, 9, 10, 10.5 and 11. And you’ll find one 24″ cable, two 32”, and one 40″, perfect for magic loop knitting. 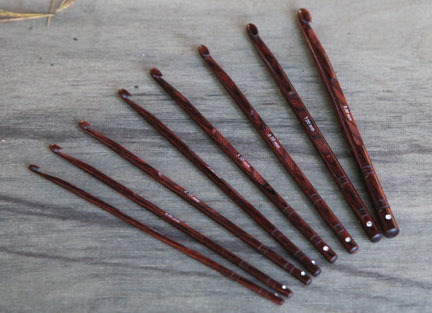 Though these tips and cables are interchangeable with the all the other Knitter’s Pride interchangeable tips and cables, you’ll notice these cables have a special deep brown color, and both the tips and cables have copper tinted brass connectors which look lovely against the dark rose colored wood. Also included in this set are 8 end caps, 4 cable keys, and a zippered storage pouch to hold all of these pieces. But the extra special item in this set is the Symfonie Rose Shawl Pin adorned with a Swarovski Crystal. The Symfonie Rose Crochet Hook Set includes US sizes E, G, 7, H, I, J, K, and L hooks. Similar to the shawl pin, you’ll find a Swarovski Crystal on the end of each of the crochet hooks in this set. The smooth, polished surface of the densified laminated Symfonie Rose wood allows the hook to effortlessly glide with any yarn. Check out our video with Cara to see a little more about each of these sets. Either of these sets would make a great gift for a knitter or crocheter you may shopping for in the upcoming holiday season. Or one of these could be a special treat for yourself as you’re working your way through making all of those holiday gifts this year. 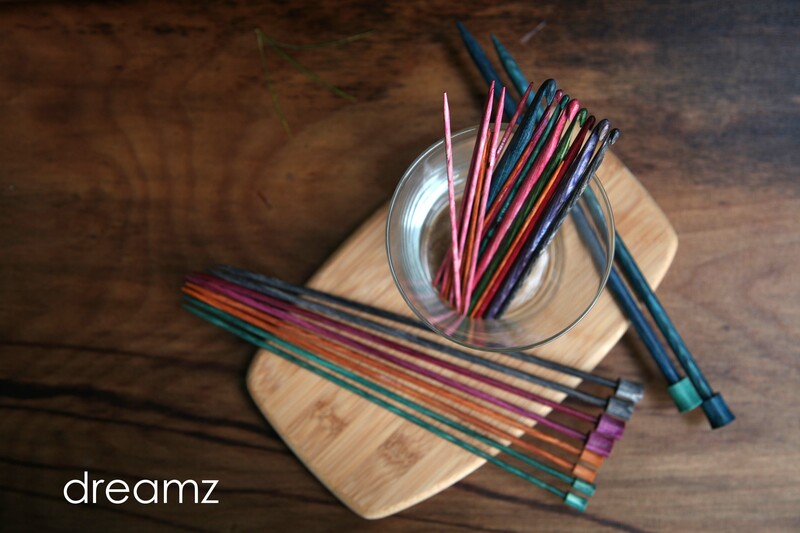 Our Dreamz knitting needles hardly need an introduction they’ve been so popular. But in case you hadn’t heard we wanted to make sure you didn’t get left out. The staff (and customers) have been particularly excited by the new line of Dreamz needles. 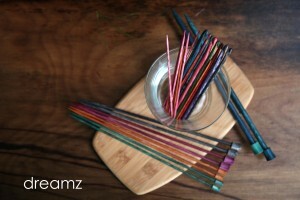 And for good reason, the Dreamz are a unique color tinted set of needles with a smooth hand at a reasonable price. The Dreamz line is so extensive I wanted to take a moment to walk you through it and familiarize you with this great and affordable needle line. The Dreamz are constructed of laminated birch, an affordable needle to make and a durable needle to invest in. Not only is it considered a dense, smooth wood allowing for sharp points and smooth finish; it is considered stronger than ebony and rosewood at a much less expensive price point. Additionally, its construction is resistant to water absorption, making it particularly suited against warping. A favorite aspect of this line is its color coded system. Each size is assigned a different lovely wood stain, and the colors are consistently matched to sizes across the Dreamz line. Sizes are marked clearly on the needles as well. We offer 10” Single Pointed Needles in US sizes 2.5–17 (3-12mm). These lightweight needles share the graduated and ample tip of the other Dreamz needles. All sizes are available separately as well as together in the Dreamz Single Points Needle Set. The set includes sizes US 2.5–11 in a stylish black jacquard zippered case. 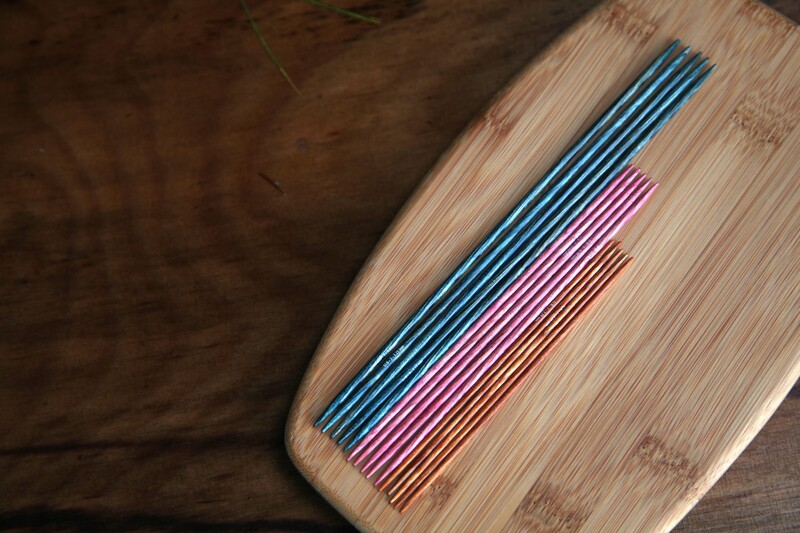 Our Dreamz Double Pointed Needles are sold in packs of 5 with a length option of 5”, 6” or 8”. The 5 and 6” lengths are available in sizes US 0–6, and the 8” spans the US 2.5–11. Additionally, there are Double Pointed Needle Sets available in 5” or 6” which include US sizes 0–3, each set is organized in its own vinyl carrying case. Although warping is of less concern for this style of needle the thinner needles will still need to be treated with care. Dreamz Fixed Circular Knitting Needless have a smooth nickel plated join and supple cord particularly suited for magic loop. The wide range of cord lengths include 16” in US sizes 0-11 and 24”, 32”, 40” and 47” in US sizes 0–19. To aid in size differentiation MM and US sizes are etched into the join as well as the wooden tip. The Dreamz Interchangeable Circular Deluxe Set is a great way to economically collect all sizes and lengths of needles in one compact vinyl case. The set comes with a set of 9 tips, US sizes 4–11. Shorter tips are available separately for creating a 16” needle to supplement the interchangeable set. Deluxe sets can be expanded with additional tips and cables including the Chunky Set, which includes US sizes 13, 15 and 17. If you aren’t ready for the investment of the Deluxe set the Starter Set provides a great low-commitment way to try them out. The Dreamz Starter Set includes US sizes 6, 9 and 10. If you haven’t set your heart on a needle material yet there’s also a Comby Set with samples of Dreamz, Nova and Trendz acrylic needles, to help you decide which needle you like working with best. Although we’ve covered the crochet line before, the Dreamz lineup would not be complete without its mention. 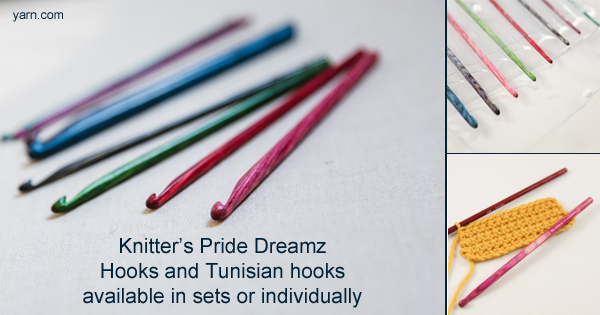 Our Dreamz Crochet Hooks and Dreamz Interchangeable Tunisian Crochet Hooks are available singly in US sizes E–12mm as a perfect supplement for any collection. The Dreamz Crochet Hook Set and Interchangeable Tunisian Crochet Hook Set sets feature sizes US E–L and come in a handy vinyl carrying case. Our trio set of Dreamz Cable Needles is a really clever set. Not only are the cable needles various lengths, they are marked with US sizes and correspond with the color coded needles. How fantastic! 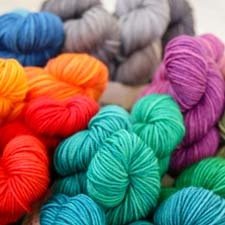 Check out this video covering the Knitter’s Pride Dreamz line. It’s clear that this has been a customer favorite. I must admit that we are smitten with this needle line as well. But don’t just take our word for it, make sure to sample these needles yourself, and see what all the fuss is about.